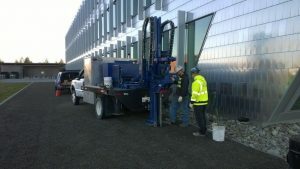 EHSI provided Washington State Voluntary Cleanup Program (VCP) support to the GSA at Federal Center South (FCS), a former industrial site adjacent to the Lower Duwamish Waterway Superfund Site (LDWSS). FCS is located along the eastern shore of the LDWSS and for this reason the Washington State Department of Ecology (Ecology) selected protection of surface water cleanup criteria for the site. The site work involved detailed site investigation and characterization, groundwater modeling, soil remediation, groundwater monitoring, and groundwater treatment planning. EHSI negotiated and managed a site cleanup plan involving total Petroleum Hydrocarbons (TPH) and Volatile Organic Compounds (VOCs). Field work requirements includes work developing environmental work plans, site specific health and safety plan (HASP), installing monitoring wells, conducting groundwater remediation design, implementation and treatment through enhanced bioremediation, and facilitation with Ecology. The final goal was to receive a No Further Action (NFA) letter from Ecology.